If you are looking to claim No Deposit Free Spins, then stop and look no further! Prepare to be blasted with some wild goodies at WildBlaster Casino! WildBlaster Casino is a newly minted NetEnt Casino on the internet streets and is giving new players a superb WildBlaster Casino No Deposit Bonus in the form of 20 No Deposit Free Spins on The Book of Dead slot. Yes, that’s right… 20 No Deposit Free Spins are yours to claim upon registration. 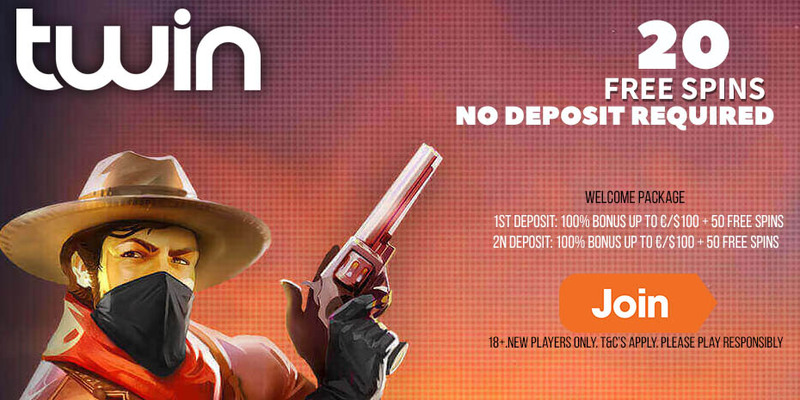 Check out the details below for how to claim your WildBlaster Casino No Deposit Bonus and First Welcome Bonus offer of 100% up to €500. WildBlaster Casino is one of our latest NetEnt Casinos that we are showcasing this month. The casino is owned and operated by Direx N.V and is licensed in Curacao. They offer fast withdrawals of winnings and have over 100 casino jackpot games. 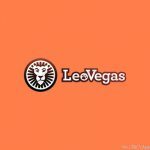 The casino also allows players to deposit using a number of different currencies, including accepting Bitcoin deposits! WildBlaster Casino has fantastic welcome bonus offers, a No Deposit Free Spins offering for new players, and also weekly bonuses and free spins offerings. The following currencies are accepted at WildBlaster Casino: EUR, CAD, NOK, AUD, USD, RUB, PLN, and BTC. The following deposit options are accepted at WildBlaster Casino: Neteller, Skrill, Sofort, iDeal, Visa, Mastercard, Bitcoin, Paysafecard, Ecopayz, iDebit, Instadebit, Svyaznoy, Zimpler, Neosurf, CoinsPaid, Mobile Commerce, Qiwi, Yandex Money, and Alpha Banks. Cashout times at WildBlaster Casino: For e-wallets cash out is instant; Credit/Debit card withdrawals take between 2 to 5 business days, while Bank transfers take between 1 to 5 business days. Processing of withdrawals takes place instantly. Sign up for a WildBlaster Casino account using the special links or banners on this page. Activate your casino account via email when prompted to do so. 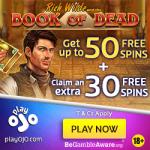 Log into your WildBlaster account, head over to the “Bonuses” section to activate your 20 No Deposit Free Spins on The Book of Dead Slot. Open the game to get spinning! Players residing in the following countries are NOT eligible to accept the WildBlaster Casino No Deposit Bonus in the form of the 20 No Deposit Free Spins offer: United Kingdom, USA, Afghanistan, Croatia, Denmark, Ecuador, Egypt, Equatorial Guinea, Eritrea, Estonia, Ethiopia, France, Gambia, Georgia, Ghana, Greece, Guinea, Guinea-Bissau, Guyana, Palestine, Panama, Papua New Guinea, the Philippines, Poland, Portugal, Romania, Rwanda, Sao Tome and Principe, Senegal, Albania, Algeria, Angola, Bahrain, Bangladesh, Benin, Bosnia and Herzegovina, Botswana, Bulgaria, Burundi, Cambodia, Cameroon, Canada, Cape Verde, Chad, Comoros, Côte d’Ivoire, Serbia, the Seychelles, Sierra Leone, Singapore, Slovakia, Slovenia, South Korea, South Sudan, Spain, Sudan, Swaziland, Sweden, Syria, Taiwan, Tanzania, Thailand, Togo, Tunisia, Uganda, Ukraine, the United Arab Emirates, Vietnam, Yemen, Zambia, Zimbabwe, Hong Kong, Hungary, India, Indonesia, Iran, Iraq, Israel, Kazakhstan, Kenya, Kuwait, Laos, Latvia, Lesotho, Liberia, Lithuania, Macedonia, Madagascar, Malawi, Malaysia, Mali, Mauritania, Mauritius, Mexico, Moldova, Mongolia, Montenegro, Morocco, Mozambique, Myanmar, Namibia, Nepal, Nicaragua, Niger, Nigeria, North Korea, Oman, and Pakistan. Please note that player restrictions apply. Players residing in the following countries are not eligible to accept welcome bonus offers: United Kingdom, United States of America, Netherlands, Netherlands Antilles (Curaçao, Bonaire, and Aruba), St. Maarten, St. Eustatius, Saba, Dutch West Indies, Curaçao, Spain, France and its overseas territories (Guadeloupe, Martinique, French Guiana, Réunion, Mayotte, St. Martin, French Polynesia, Wallis and Futuna, New Caledonia). Wagering requirements: 35x for welcome bonus offers, and 45x for free spins winnings. Only new players may be eligible to receive the welcome bonuses and No Deposit Free Spins offers. Players from the following countries may not accept the Registration Free Spins offer: United Kingdom, USA, Afghanistan, Croatia, Denmark, Ecuador, Egypt, Equatorial Guinea, Eritrea, Estonia, Ethiopia, France, Gambia, Georgia, Ghana, Greece, Guinea, Guinea-Bissau, Guyana, Palestine, Panama, Papua New Guinea, the Philippines, Poland, Portugal, Romania, Rwanda, Sao Tome and Principe, Senegal, Albania, Algeria, Angola, Bahrain, Bangladesh, Benin, Bosnia and Herzegovina, Botswana, Bulgaria, Burundi, Cambodia, Cameroon, Canada, Cape Verde, Chad, Comoros, Côte d’Ivoire, Serbia, the Seychelles, Sierra Leone, Singapore, Slovakia, Slovenia, South Korea, South Sudan, Spain, Sudan, Swaziland, Sweden, Syria, Taiwan, Tanzania, Thailand, Togo, Tunisia, Uganda, Ukraine, the United Arab Emirates, Vietnam, Yemen, Zambia, Zimbabwe, Hong Kong, Hungary, India, Indonesia, Iran, Iraq, Israel, Kazakhstan, Kenya, Kuwait, Laos, Latvia, Lesotho, Liberia, Lithuania, Macedonia, Madagascar, Malawi, Malaysia, Mali, Mauritania, Mauritius, Mexico, Moldova, Mongolia, Montenegro, Morocco, Mozambique, Myanmar, Namibia, Nepal, Nicaragua, Niger, Nigeria, North Korea, Oman, and Pakistan.